It contains four exogenous ketone salts derived from BHB while most other products contain only two to three. It provides the best daily serving of 2,000 mg of BHB ketones for effective results. It contains MCT Oil to further boost ketosis. It has added Bioperine which increases the body’s ability to absorb the ketone salts. Comes with an excellent money-back guarantee. Continue reading to learn all the details about this top-notch product and why we would recommend it. Beta-Hydroxybutyrate – A naturally-occurring compound found in the body which helps the body get into ketosis when consuming a low-carb, high-fat diet. Ketosis is when the body will start burning fat for fuel instead of glucose which is what provides effective weight loss results. Taking BHB (exogenous ketones) in supplement form helps speed up this process of ketosis. MCT Oil – A medium-chain fatty acid that is easily broken down by the body and can alter your metabolism. Provides an added boost of ketones in the body to speed up ketosis. Bioperine – Helps the body better absorb the exogenous ketone salts. Keto Premium contains the four main exogenous ketones derived from BHB which is the most effective compound for boosting ketosis in the body. When these are taken in a supplement form, it helps to speed up the process of ketosis and allow for faster results when following a ketogenic diet. These ketone salts will also help replenish electrolytes which are lost through the diet and help overcome any side effects of the diet such as the keto flu. It is advised to take one capsule, three times a day. So you should take one capsule in the morning, one in the afternoon and one in the evening for the best results. This will provide the optimal daily serving of BHB ketones at 2,000 mg for the best ketosis boosting results. All the ingredients found in this product are completely natural with no additives, fillers or any unnecessary ingredients so the risk of side effects is very low. This product has also been third-party tested so you know that what you are consuming is exactly what it says on the label; nothing less, nothing more. Pregnant and nursing women, those under the age of 18, and anyone with a medical condition are advised to speak to their doctor before trying this product. 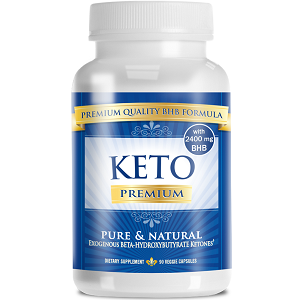 You can buy Keto Premium directly from the manufacturer’s website or from Amazon. There are various package options which allow you to save money with the more bottles you buy, which is a fantastic notion for a weight loss product as you will generally go through more than one bottle. You can buy one bottle for $48, three bottles for $91, four bottles for $112, or six bottles for $138. This six-bottle package brings the price of each bottle down from $48 to $23. That’s a huge discount and one worth taking advantage of. If you are concerned about buying multiple bottles to take advantage of the discounts in case the product doesn’t work for you, you don’t need to. Keto Premium comes backed by an excellent 90-day money back guarantee which applies to both used and unused bottles. This means that if you are not happy with the product, you can return all the bottles even if you have opened them and get a full refund, minus any shipping costs. Contains four ketone salts derived from BHB which is higher than most other products. Provides a 2,000 mg daily serving of BHB ketones which is also higher than most other products. Contains MCT oil for an added ketosis boost. Contains Bioperine for increased absorption. John Parker	reviewed Keto Premium	on July 29th	 and gave it a rating of 5.